Tatem Web Design created an expandable Healthcare Management Joomla based CMS system to be able to encompass the many health care management services offered by the company. We integrated an online job application solution for users to be able to apply for health care management positions online. 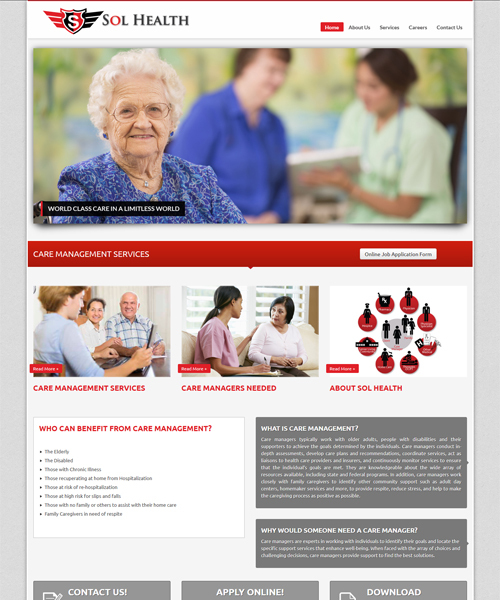 We also did a custom design template so that it professional represents the Healthcare companies look and feel. The client supplied the logo and the company colors to create the website. The Health Care Management website is fully expandable and Tatem Web Design trained the client to be able manage their content and job applications that are stored to a local database on the web hosting. We provided full training to the health care companies staff so they could manage the online applications.